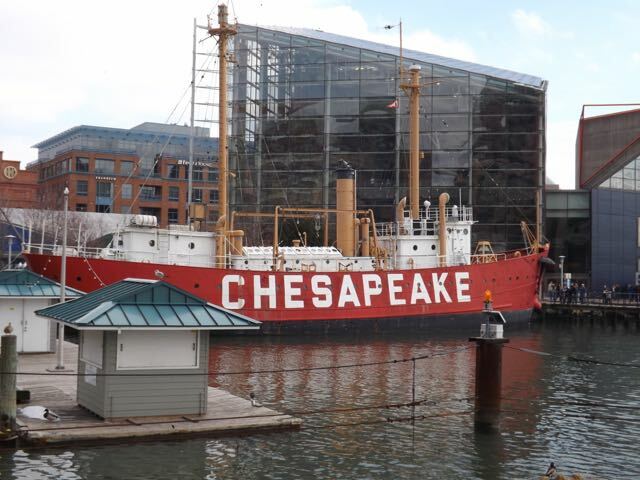 Workday: Historic Ships in Baltimore – March 18, 2017 – Chesapeake Chapter U.S.L.H.S. It was a small crew on our first workday of 2017. It started damp, overcast and a bit chilly. By the time we emerged for lunch there were blue skies and pleasant temperatures. 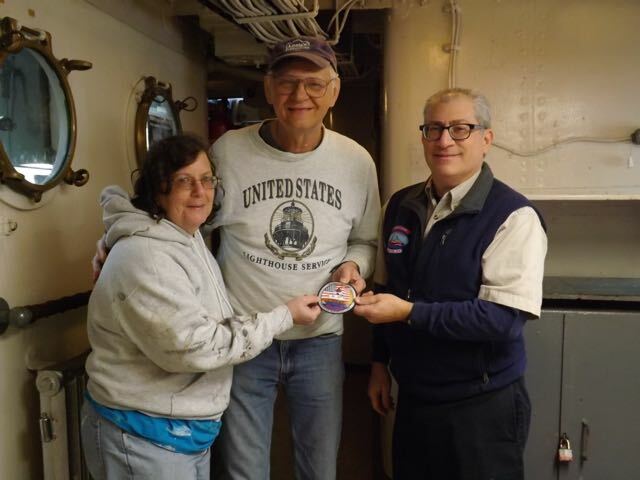 We were finally able to catch up with Tony Pasek and present him with his 1000+ Hour Volunteer patch. Tony has worked at lighthouses from Concord Point to Point Lookout and many of the lights in between. He and Hobie Statzer are a powerful duo, they are the first two recipients of the 1000+ hour patch. 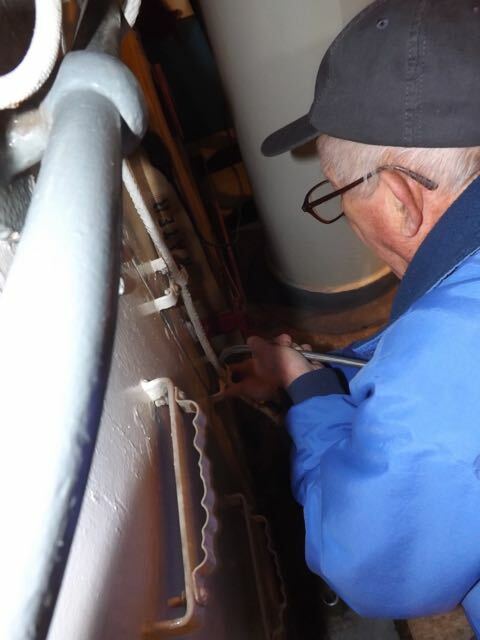 Thanks for all that hard work Tony. There were four volunteers who attacked various surfaces with paintbrushes. We put a coat of paint on some of the bins in the Lathe room and scraped and primed another set of bins. The room is really taking shape. 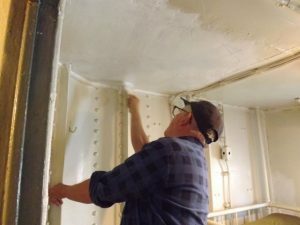 Other areas receiving some attention were one of the crew cabins that got scraped and primed last year, the inside of one of the display cabinets received a second coat of white paint and the Fidley got some touch up. 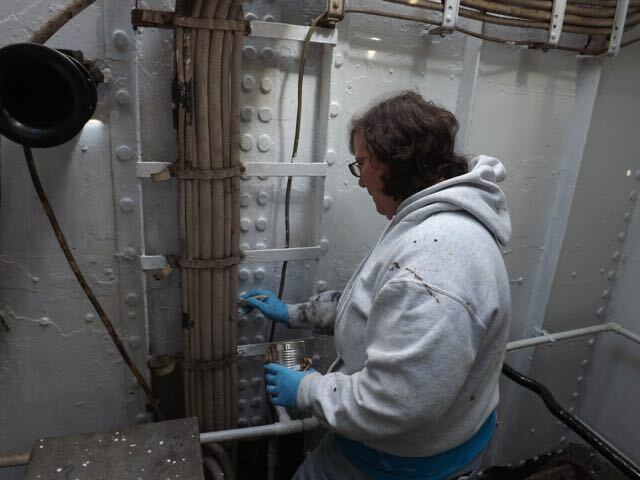 We also strung some new electrical wire from the Fidley down to the engine room. That involves tracing the lines, pulling the old one out and threading the new one to the final location. That involves climbing ladders and other stationary objects and pulling and tugging and cutting. It helps if your flexible. 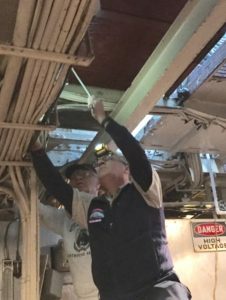 We made pretty good progress for such a small crew. Tony and Greg working on wiring.